Do they need to be percentages? Proportions? Weights? To test the numbers on my various colors, I have been plugging them into the Dye Mixer Applet. Sometimes the applet results matched the html sample, sometimes they didn't. After a little research, I have learned some interesting things about the applet in this comment on Paula Burch's Dye Forum. Namely, that the "mix amount" numbers only give approximate results. Considering the samples that didn't match, that's a relief. I also learned that those numbers don't indicate any specific unit of measurement. That's not a relief, that's a "now what." The CMYK (cyan, magenta, yellow, & key black) color model that I'm trying to use, is for printing inks on paper. The numbers stand for percentages of each color. So for computer color #0025B9 (above), the printer would reproduce it on paper by using 100% cyan, 80% magenta, and 28% black inks. Obviously this cannot be translated directly into proportions for a dye recipe, because then I would have to be working with 208%. Which lead me to another question, what unit of measurement? 48 teaspoons (or even 48 eighth teaspoons), is out of the question here in terms of dye amounts. And from what I have learned from the DyersLIST archives, Procion MX dyes do not all weigh the same anyway. This means that a teaspoon of one color doesn't necessarily weigh the same as a teaspoon of another color. So, kitchen measurements are definitely out and metric measurements are definitely in. The next question is on mixing. Do I mix the individual powders to make one dye stock, or do I make up individual dye stocks and then mix them? Considering that I will likely need to do quite a bit of sampling, mixing individual dye stocks makes more sense. Plus, it is safer to work with the dyes in solution rather than in powdered form. True, solutions won't keep all that long, but without the activator (soda ash), I should be able to use them up quickly enough. And then there's the question of how well fuchsia will substitute for magenta and and turquoise for cyan. Also, which yellow is best? And what about black? There is no true Procion MX black as all the various blacks are mixtures of other colors. I think only experimentation can answer this for me. Measure mini-skeins of 12.5 grams each as samples. Based on the yards per pound, I have calculated that my yarn has 5.55 yards per gram, so I will need to measure out 69 and 1/3 yards per mini-skein. Mix up 1% stock solutions for the individual colors and mix the colors based on the percentages I calculated. I'm doing 1% instead of the usual 2% as it will be easier to work with the hex code numbers this way. Start with a dark depth of shade (dos), since the color #0025B9 (above) is a fairly deep blue. I will make adjustments from there. One last question I have is based on some of the research I've been doing. That the depth of hue can vary amongst the various Procion MX colors, even if the same weight /amount of dye is being used. I hope I'm saying that right. I found this as a question in the DyersLIST archives, but with no clear answer. I've seen this somewhat with my own experiments: I got a bright yellow but a softer red, even though I used the same amount of dye powder for each color. I got a red more equal in intensity to the yellow by doubling the amount of dye powder. Am I making sense? I'm probably not using all these terms accurately, but I hope you get my drift. Anyway, I don't have any concrete facts to work with here, so I'm not going to worry about for now. I figure that I can't correct my course if I don't begin the journey. I have absolutely no idea where I will end up colorwise, but at least I'm making a start. Oh my goodness. Your work just boggles my mind! More to the point, the business about yellow and red. What you have learned is that yellow is a weak color. And red is a very strong color. That's why yellow at the same DOS as red comes out lighter. This will be important in your mixing of colors. If you are mixing yellow and red to create an orange, it takes a LOT more yellow than you might expect to have any impact at all on the red. Another thing you've learned is that you just have to experiment because there are so many different variants of the basic hues. One of the joys of Sabraset/Lanaset dyes is that there are far fewer choices! Finally, the weight problem will grow more and more heavy on you as you continue playing. Perhaps you could use Craigs list or Ebay to find a used scale? You are better off finding a good used scale than a cheap new one. An it doesn't have to be electronic. The good old balance beam works just fine. You might ask on the dyers list if anyone knows of any sources for used scales. You can download it to your hard drive. Yellows are always tricky, as I've found I need to use usually double the yellow in a recipe to make it look right. My greens are about a 7:1 ratio of 1% yellow and 1% turquoise dye solutions, and oranges are about the same ratios of yellow to magenta. In both Procion MX and Jacquard Acid dyes, I've found the yellows to be somehow 'weaker' than the same percentage solution of any other color. I think it's because the dyes aren't as opaque as printer's inks (although CMYK is supposed to be a better approximation of translucent colors versus the traditional Red-Yellow-Blue color wheel). I've been pondering the difference between inks and dyes, and your reasoning makes a lot of sense. CrazyMonkey. I'm not sure how (or if) I can be apply this to reproducing computer colors with dyes, but I'm certainly learning a lot in the process. Sharon, considering what I'm thinking I've gotten myself into, I might want to join you on the sidelines! Wow! You make it sound so easy but I'm sure its not. It's always so interesting to look at how different brains approach different problems. So really you are still working with only 100% -- not the 208%. Obviously, all of this is just theoretical at this point. Although there isn't yellow here --yellow is weaker as others have stated and whenever you mix it with black -- a teeny touch of red can help keep it from turning greenish. You are making complete sense -- and this is such a very cool process to be watching and learning from! It is so great that you are documenting all of your proceses on your blog -- why? Because when you have got a really good handle on how to do this, I really think you ought to seriously consider writing it all up into a book. Jane, what an excellent idea. I will add that to my list of things to try. My first dyed samples don't match my color chips, so I have my work cut out for me. I would love to be able to put this together into a book. That's assuming that I have successful results in the end of course! You amaze me!!! You put so much thought into each one of your projects, take the time to write them down and post them on your blog. I agree with Jane, you should write a book on all your studies. Unlike me who puts some dye stock in a pot and hope for the best. Actually, Bspinner, tossing randomly into a dyepot is me too. I'm trying to reform however and keep track of what I'm doing. I still feel pretty random however as I don't really know what I'm doing. I'm getting good ideas from the comments however. I ahve been catching up on your posts, Leigh - astouding, Girlfriend! Just astounding! You should get a medal for all that you've been doing. Off the subject just a wee bit...the next time you look at a garden of flowers you can see where you can use colors as a pallette as well - I learned alot working for our Arboretum. It's amazing how they "blended" cloros together to give impressions. Yellows were a big thing, I remember. Mother Nature has quite the range in yellows and to tone them down we mixed in reds, blues, etc. but it took 3x another color to tone down the yellows. Now you are inspiring me to get some white sheep and start dyeing again! And thank you for inspiring us to exercise our brains! I know this is sweeping the cobwebs out of mine! Just want to let you know I LOVE what your doing and read your blog regularly. I'm a "shot from the hip" dyer and enjoy all colors. Mim, I confess that basically I'm a pretty serendipitous dyer myself. I'm not sure what got into me to even begin this project in the first place! 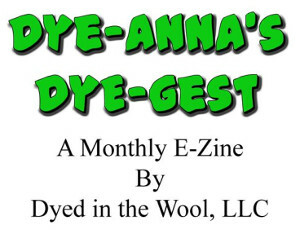 Kathy, I'd love to see some dyeing on your blog! And I have to say that you're inspiring me to start taking my camera with me and take more of my own photos. You are absolutely correct about nature being an excellent source of color. Wow! I have to admit my head is spinning. But if I read your post very sloooowly and carefully it all begins to make sense. Looking forward to more updates. Wool Enough, I have to admit that I probably wouldn't read through all this if I didn't write it. I've just found that it is the best place to keep my information, as opposed to one of the half dozen or so notebooks I keep lying around. By using my blog as my journal, I always know where to find the information again!